Do you guys remember the last time we visited the Pet Days event in Orange County? It doesn’t seem like it was that long ago, but I just took a look back at the archives and we went to the First Pet Days way back in 2008! I bet a lot has changed since then and hopefully it has expanded well beyond the small section it occupied 5 years ago. Anyhow, we’re going back to the Fall Pet Days and we’ll be there representing Guide Dogs of America! I’m scheduled to be there this Sunday, November 3rd from 9am-12pm. Unfortunately, Adelle will not be joining me (she’s a Canine Support Teams pup). However, I will be working with GDA puppy in training, Duncan. Here’s Duncan as a puppy (he’s the little guy). 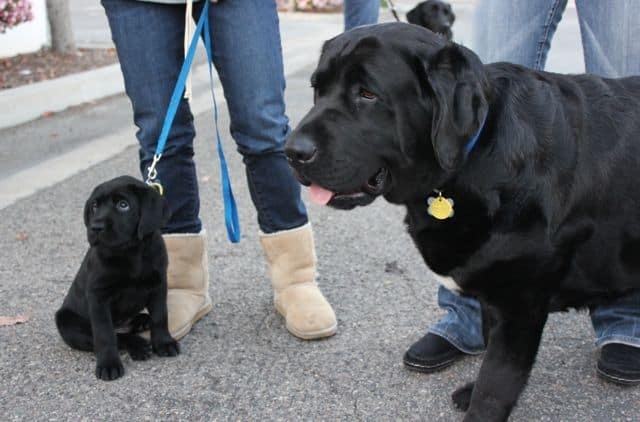 Duncan’s no longer a little guy…he’s probably closer to the size of Swagger (the big guy in the pic). 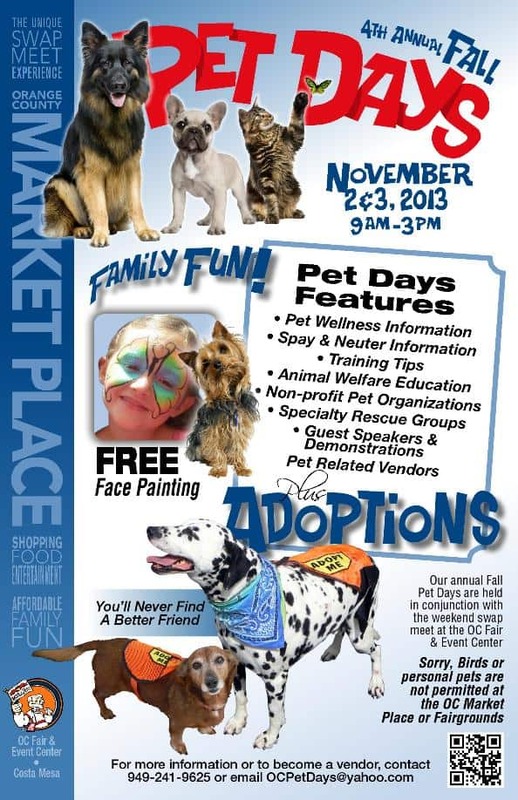 Our annual Fall Pet Days are held in conjunction with the weekend swap meet at the OC Fair and Event Center. Sorry birds or personal pets are not permitted at the OC Marketplace or Fairgrounds. It’s only a few days away so don’t forget to mark your calendars. If you do decide to go don’t forget to stop by our GDA booth and say hello. Duncan and I will be there Sunday from 9am-12pm. Have you been to one of the past Fall Pet Days at the OC Fairgrounds? If so, what did you think about it? Hopefully we see you guys this weekend! Sounds like a great event! I’ll be sure to share with my friends in that area! We went 5 years ago and it was on the small side. Maybe 30 booths and a stage area where they were showcasing some of the adoptable dogs. I’m hoping it’s expanded since then, but the Pet Days booths did benefit from foot traffic from the OC Swap Meet. Thanks for sharing!